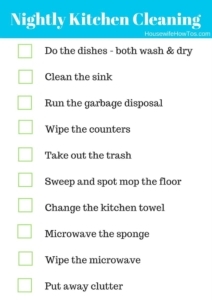 Recently, I received an email asking if I have a printable nightly kitchen cleaning routine. I’ll confess: tidying the kitchen at the end of the day isn’t usually my chore, so I’ve never given it much thought. See, we have a rule in our house: the person who cooks the meal doesn’t have to clean up after the meal. I cook 99.5% of our meals, and I clean as I go, so when I’m finished cooking I’m out of there and I don’t feel guilty about it. That’s not to say my family doesn’t have post-dinner tasks; they’re just not my tasks, and after years of nagging my family pretty much knows what needs to be done. But for those who are curious, here’s the routine in our house once dinner leftovers have been put away. 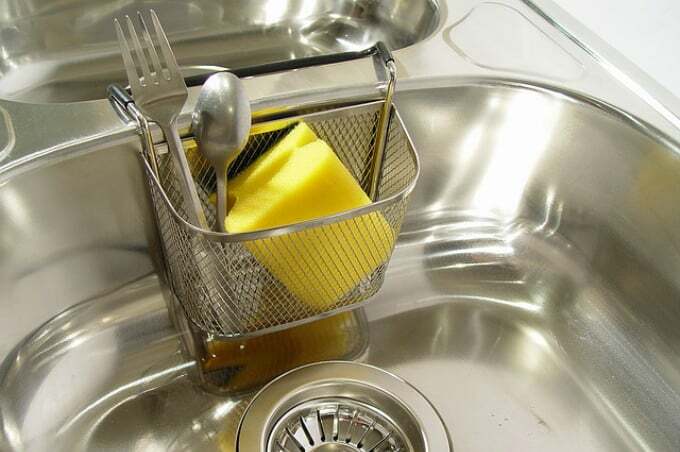 Do the dishes: Whether you wash by hand or use the machine, get the dishes clean so you aren’t attracting bugs. Clean the sink: Scrub it with soap and water. If it’s scuffed or stained, sprinkle some salt or baking soda on it and scour until it’s clean. Run the garbage disposal: Even if you don’t remember putting stuff down the disposer, it’s a good idea to run it for a good 30 seconds with the hot water running to get rid of any crumbs and grime. This goes a long way toward keeping your kitchen drain from stinking, too. Take out the trash: This is a sore spot in my house since my husband prefers to smash the kitchen trash down night after night, hauling it outdoors only when he can’t make 4 more inches of space in there. I, on the other hand, am adamant about the trash being emptied nightly. After 16 years, we’ve reached a compromise: he takes out the trash. Vacuum and/or spot mop spills: Even though I sweep the floor as part of my daily cleaning routine, having two cats means we need to give the floor a quick once over at night, too. 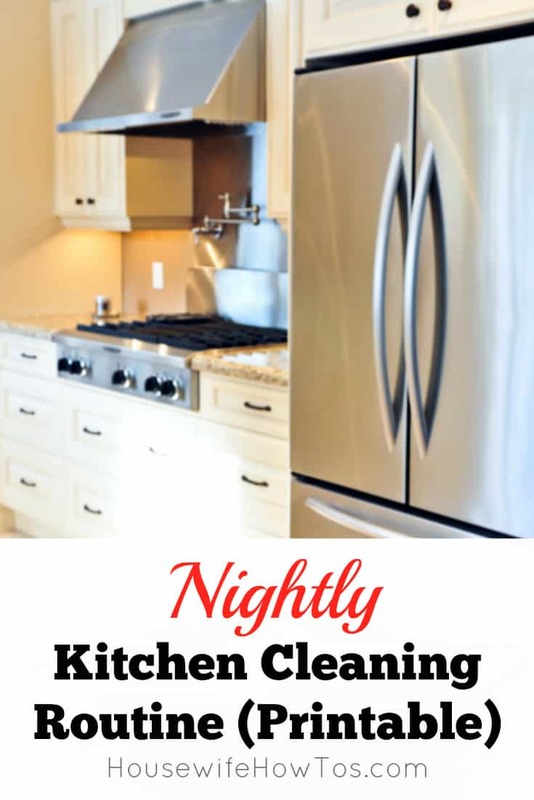 • How to Have a Spotless Kitchen All. The. Time. The link isn’t working anymore. Thank you for letting me know, D D. I changed servers over the weekend to improve reader experience but, unfortunately, some of the links broke in the process. This one is fixed now. Sorry for the inconvenience!